could be a novel all on its own." Jez has been traversing the world of costuming for about 15 years now. She started Live Action Role Play in her first year of college and has been going ever since. 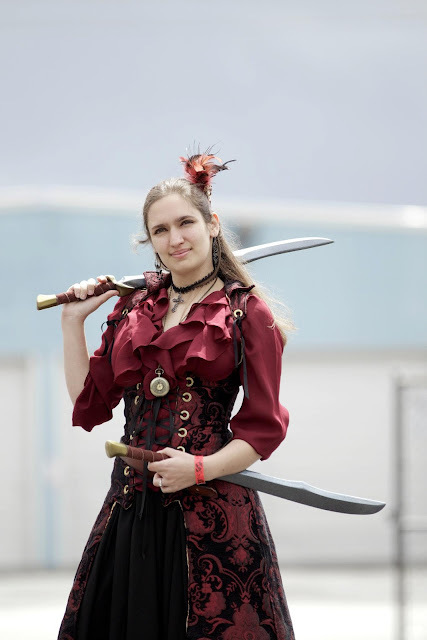 In fact, she now runs her own events with Utah LARP. 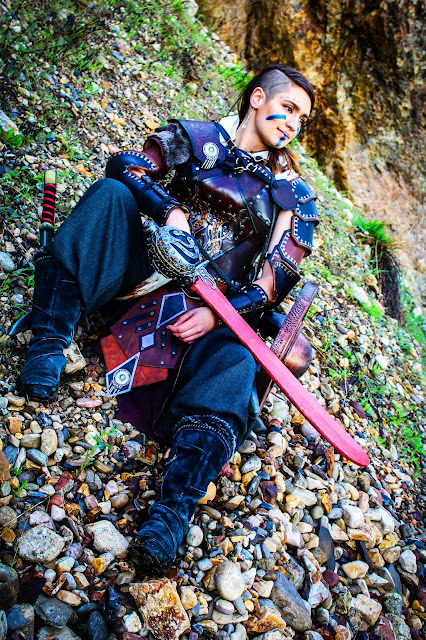 Jez tells us below just what LARP is, gives advice on character creation, and shares her adventures in the magical worlds she has helped create. Each picture has a short description about the original character Jez created and a little bit is revealed about their story. Links to Fabricated Geek - her stuff is awesome, follow her. 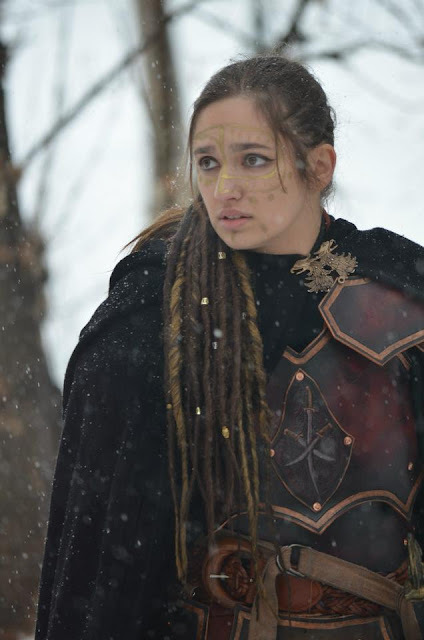 How would you explain LARP to someone who has never heard of it before? We all know LARP is short for Live Action Role Play. But there are a lot of different styles of games that all fit under that banner. The type of games I run and most often participate in are a blend of both live combat and role play. It's a type of interactive improvisational theater that ends up being community storytelling. Take Lord of the Rings as an example. Every character had their own story, their own contribution, their own motivation. LARP is like that. Frodo didn't actually have the story to himself, even though he volunteered to complete their main task. Every character is playing out their own story, with their own goals and motivations, and helping everyone else with theirs. Books and movies can be predictable, but people, when you give them their own freedom, rarely are. Plus, getting to hit your friends with fake swords for a weekend is incredibly fun. her own death to expose the corruption that had made its way into her homeland." What was your first experience with LARP and what made you want to continue? My first time LARPing was during my Freshman year in college, and honestly it was a complete disaster. I found a local game that I could get to by bus (which of course my first time taking the bus), except I ended up getting on the bus headed in the opposite direction. So I arrived at the park an hour late. I was the only female at the game, so I got to play the damsel in distress. I ended up giving a handful of people a scare when I was told to "go to the other side of that hill and scream bloody murder," since the NPC I was playing was getting kidnapped into the Abyss. Apparently they weren't expecting me to go full blown with my scream. As for why I kept going with it, I fell in love with getting to tell a story and reacting to other people telling their stories along the way. Usually stories, as books or movies, all come from one person’s vision. With LARP that’s never the case. There’s always something you didn’t see coming from someone else, which makes for a more interesting story in the end. It's really hard to choose just one thing! I’m a total sucker for good emotional role play, but I think I have to go with the costumes. I love creating the visual identity for characters. Every PC I’ve played has their own look and feel that’s unique to them. Each outfit has a couple small accessories with their own story of how they were acquired. There's nothing quite like putting on a costume and just falling into the character's persona. Plus, costuming for a LARP has its own set of challenges. Not only does it need to fit the character and the setting, it needs to be durable enough to withstand a lot of movement. And, above all else, has to be comfortable enough to wear for a whole weekend (which also means it has to be able to be laundered on a regular basis). What is it like running your own game? Really, it's exhausting. You don't realize just how much goes into getting everything ready until you've done it yourself. But while it's a ton of work, it's worth it when it all comes together. Having a team of people who are just as excited as you are to help bring a fantasy world to life helps immensely. And pulling off a successful game where the players are enjoying the plot and the experience makes it all worth it. What is the toughest part of running a game? Trying to predict how players are going to respond. I’m not a fan of railroading players into having to follow or act as I want them to. I’ve participated in games like that and it just wasn’t fun to play. So there ends up being a lot of guess work that goes into planning for all of the likely scenarios that might play out. And then occasionally you have to come up with ideas on the fly when the players do something completely unexpected. Jez as Caitlin from the world of Untamed. may have been heavily based off on the brothers from Boondock Saints.)" When coming up with a character to play, what should a newcomer look out for? First, read your setting guide and talk with your plot team! There's nothing that feels more defeating than coming up with a really fleshed out concept that just doesn't fit into the world. And they’re [the plot team] honestly there to help. When working on the character’s backstory, make sure they have room to grow. A lot of people try to create a backstory filled with a ton of accomplishments, but with the long-term campaigns you'll accomplish a lot as you go. Try to make them a real person. Unfortunately, we're all pretty much guilty of some ridiculous tropes with first characters. I myself had the fae with multiple personality disorders and frequent bouts of amnesia. I thought it was the most original and awesome concept at the time. Turns out your whole village doesn't have to be murdered to actually motivate someone to go see the world. Which character has been your favorite to play? I've had about a dozen characters since I started this hobby, and hands down this goes to the PC who I just retired last year, Kaskara. I played her on and off for three years (from the start of the campaign to the end). Playing her was definitely the most emotionally vested I've gotten in a character. Originally she was supposed to be calm and disconnected, but sometimes characters don't end up how you write them, and they just take on a life of their own. She turned out to be passionate, hard headed, stubborn, and loyal to a fault. Kas was incredibly dedicated to her religion, her people, and her friends. While we certainly shared some traits, she pushed my acting abilities more than any other PC I’ve played to date. I definitely look at the world a bit differently now because of my experiences playing her. Jez as Kasakra in her Duuntey'un wedding outfit from the world of Rexerit. "Kas fell in love a Duuntay'un warrior whose stubbornness rivaled that of her own! and be admitted on her own before she would go through with it." Utah LARP is starting a new campaign this year. What things do adventurers get to look forward to? A lot! I’m really excited for everything we have planned. The world of Rexerit is still in the process of recovering from the Empire’s War, which affected nearly every nation on the planet. There’s a lot of political unrest that is simmering as people are trying to return to a peaceful time. Unfortunately, there is also the problem where the written word is unreliable. Documents have been known to have their contents changed, and one of the largest libraries had all of its books essentially wiped clean. Players get to look forward to challenging plots filled with politics, mystery, and intrigue (plus a few dashes of comedy and horror). Even the most morally firm characters may find themselves questioning their choices on occasion. But in the end, how the plots evolve and what comes next is completely in the players’ hands! It’s their actions that ­­will determine exactly what challenges and potential triumphs they will face. Thank you Jez! Fun Fact: Jez is the reason I make costumes! 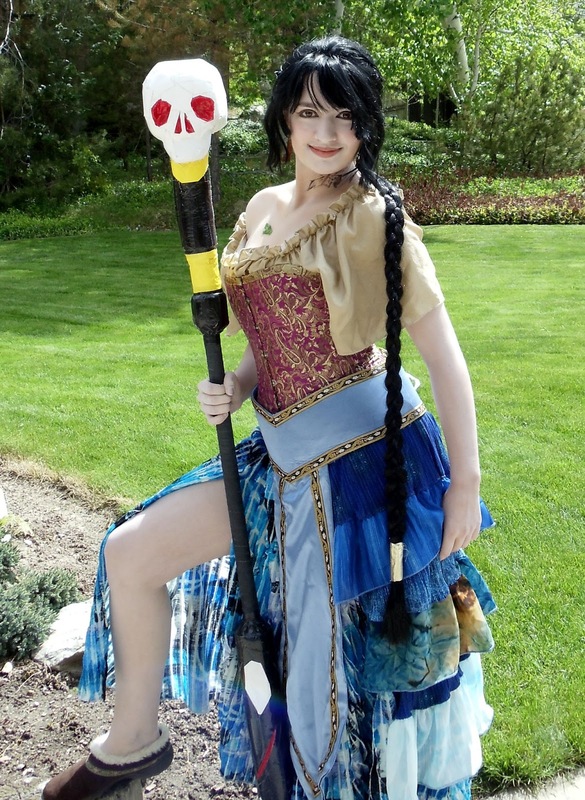 We both started college at the same time and she took my shy self and threw me into the world of cosplay and LARP. Speaking of which, now that I am graduated... that new Rexerit Campaign is sounding mighty fun. I'm going to go brainstorm some characters! !